Many people would love to grow onions, but due to a small garden or perhaps no garden at all, they just don’t have the space. There is a solution though; they can try growing onions in container gardens. Growing onions in containers allows you to be growing onions indoors or in a small space in your backyard. 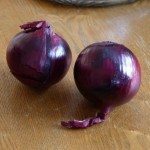 The way how to grow onions in container gardens is much like growing onions in the ground. You need good soil, adequate drainage, good fertilizer and plenty of light. Read this article on growing onions for more information on basic onion care. Really, the only difference between what you do when you grow onions in the ground and when you grow onions in pots is choosing the container you’ll be growing them in. Because you need several onions planted to get a decent crop, attempting to grow onions in pots that are only 5 or 6 inches wide would be cumbersome. If you choose to grow onions in pots, choose a large mouthed pot. It needs to be at least 10 inches deep, but should be several feet wide so that you’ll be able to plant enough onions to make it worth your while. Many people have success growing onions in a tub. Because plastic tubs are much cheaper than a comparable sized pot, growing onions in a tub is economical and efficient. Just make sure that you put holes in the bottom of the tub to provide drainage. You can also grow onions in 5 gallon buckets, but realize that you may only be able to grow 3 or 4 onions per bucket as onions need at least 3 inches open soil around them to grow properly. Whether you decide to growing onions in a tub or in pots, it’s essential that you put the onion container somewhere that gets six to seven hours of light. If you are growing indoor onions and don’t have a location with adequate sunlight, you can supplement the light with fluorescent bulbs set close to the onions. A shop light on an adjustable chain makes an excellent grow light for people who growing indoor onions. Water is an important to growing onions in container gardens because your container onions will have little access to naturally stored rainfall from surrounding soil like onions grown in the ground do. Onions grown in containers will need at least 2 – 3 inches of water a week, perhaps even more in hot weather. Check your onions daily, and if the top of the soil is dry to the touch, give them some water. Just because you have limited space doesn’t mean that you need to limit what you grow. Growing indoor onions or growing onions in a tub on the patio is fun and easy. Now that you know how to grow onions in container gardens, you have no excuse not to. General Tree CareWhat Is Tree Sap? Read more articles about Onions.